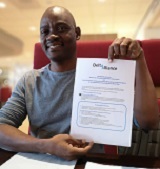 The Delta Alliance Benin Wing (DABJW), member of Delta Alliance International is an international knowledge-driven network organisation with the mission of improving the resilience of the world’s deltas. DABJW brings organisations, institutes, developers and experts together who live and work in and around the deltaic systems in Benin and neighbouring countries. The Ouémé Delta in Benin is the focus area for the work of DABJW. The wing is coordinated by Mr M. Djondo ED of the Benin Environment and Education Society (BEES) and organisations and research institutes such as the National Institute of Water, the Faculty of Arts and Human Sciences, and the Benin Global Water Partnership. They form the Steering Committee of the DABJW team. Ouémé River is the largest River of Benin Republic. Its main course is ca. 510 km long. It takes it source in the Tanéka Mountains in the Department of Atacora and receives two main tributaries, Okpara (200 km) and Zou (150 km). 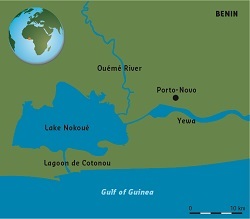 The Ouémé Delta is the most important of the two Benin delta's. This delta is sustained by both two rivers (Ouémé and Sô), and includes a lake, a lagoon and a channel to the sea. The delta is classified as a Ramsar site (1018) known as Basse Vallée de l'Ouémé, Lagune de Porto-Novo, Lac Nokoué. The Delta complex is facing challenges due to population pressure, unsustainable management and climate change. 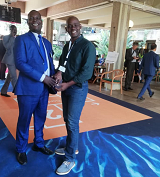 Delta Alliance Wing coordinators from Kenya and Benin met UNEP, IUCN and others during the fourth session of the UN Environment Assembly (UNEA-4) that took place from 11-15 March 2019 in Nairobi, Kenya. Under the overall theme, ‘Innovative Solutions for Environmental Challenges and Sustainable Consumption and Production,’ the following topics were addressed: Environmental challenges related to poverty and natural resources management, including sustainable food systems, food security and halting biodiversity loss; Life-cycle approaches to resource efficiency, energy, chemicals and waste management; Innovative sustainable business development at a time of rapid technological change. The opportunity was taken to exchange recent Delta developments in Benin and Kenya, discuss sustainable financing and promote the Delta Alliance and its 2019 programme including the plan of action for the establishment of the Africa Deltas Alliance Network on research and knowledge exchange (AfDAN) lead by the Kenyan Wing Coordinator. Mr. Peter Odhengo. Signing of the Membership Agreement Delta Alliance - Benin Wing (September 2018), The Delta Alliance welcomes Benin as new Wing! The Ouémé River and delta is the largest system of Benin Republic providing vital ecosystem services for the livelihoods of many millions of people. Unfortunately population pressure and unsustainable infrastructure development, inadequate management of natural habitats and resources, and pollution threaten the productivity of coastal ecosystems. Moreover, today climate change is a major threat to sustainable development due to Benin low adaptive capacity and high dependency on climate-sensitive resources, such as water resources and ecological systems. On 28 September 2018 in Delft (The Netherlands) the membership of Benin as Delta Alliance Wing came into place. Benin joined the 18 international deltas of the Delta Alliance following for the African continent Ghana, Egypt, and Kenya. The Delta Alliance now consists of 19 Wings from 16 countries.